Jesse Pantuosco questions New England's decision to trade Jamie Collins and recaps Chicago's upset win on MNF in Tuesday's Dose. Jay Cutler threw for 252 yards and a touchdown after missing five games with a thumb injury, rookie Jordan Howard ran for a career-high 153 yards and a TD, and the Chicago Bears stunned the Minnesota Vikings 20-10 on Monday night. Jay Cutler returned from injury and threw for 252 yards and a touchdown Monday to lead the struggling Chicago Bears to a 20-10 upset of the Minnesota Vikings. Rookie Jordan Howard ran for 153 yards and a score for the Bears, who improved to 2-6. Cutler, who missed five games with a sprained thumb, completed 20 of 31 passes as the Bears snapped a three-game losing streak. (The Sports Xchange) - Jay Cutler threw for 252 yards and a touchdown and Jordan Howard ran for 153 yards and a score as the Chicago Bears beat the Minnesota Vikings 20-10 at Soldier Field on Monday. Cutler, who missed five straight games with a sprained thumb, was efficient and completed 20 of 31 passes for Chicago (2-6), which snapped a three-game losing streak. Cutler's 11-yard touchdown pass to Alshon Jeffery gave the Bears a 20-3 lead with 9:52 remaining in the third quarter. Jay Cutler threw for 252 yards and a touchdown and Jordan Howard ran for 153 yards and a score as the Chicago Bears beat the Minnesota Vikings 20-10 at Soldier Field on Monday. 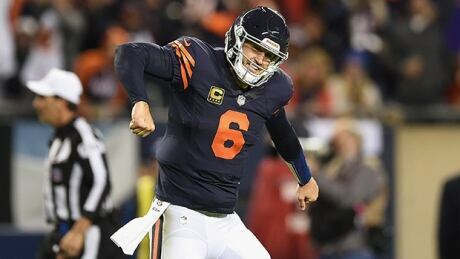 Cutler, who missed five straight games with a sprained thumb, was efficient and completed 20 of 31 passes for Chicago (2-6), which snapped a three-game losing streak. Cutler's 11-yard touchdown pass to Alshon Jeffery gave the Bears a 20-3 lead with 9:52 remaining in the third quarter. The Dallas Cowboys are as good of a pick as anyone. It’s not like Dallas is a balanced power on both sides of the ball. Rookie quarterback Dak Prescott is protected well by a great offensive line and he has been remarkably efficient. Jay Cutler's halftime speech - yup, that Jay Cutler - helped the Chicago Bears turn a strong start into one surprising victory. Cutler threw for 252 yards and a touchdown after missing five games with a thumb injury, rookie Jordan Howard ran for a career-high 153 yards and a TD, and the Bears beat the Minnesota Vikings 20-10 on Monday night. Chicago (2-6) sacked Sam Bradford five times while handing NFC North-leading Minnesota (5-2) its second straight loss. Quarterback Sam Bradford probably wishes now he'd bought travel insurance for the journey that brought him to Minnesota just in time for the season opener. What seemed like a steal for most of the last two months as the Vikings cruised to a 5-0 start increasingly feels like a bad trip. The Chicago Bears exploited the same weaknesses in a 20-10 victory Monday night the Eagles had a week ago, plowing through a slapped-together offensive line and sacking Bradford five times. At this point, it doesn’t matter what costume the Vikings put on their offensive line — it’s downright ghoulish to see what’s happening up front. Last week, we wrote that the Vikings still have the chance to overcome that weakness. Starting tackles Jake Long and T.J. Clemmings had nightmarish games, unable to block the Bears’ Akiem Hicks, Pernell McPhee and Leonard Floyd most of the night, and it reduced the Vikings’ offensive options to the last call for trick or treating. You are currently browsing the Sportspool.com Sports News blog archives for October, 2016.